Glaucoma is a condition that involves an increase in pressure inside the eye. It occurs when the fluid in the eyeball, known as aqueous humour, fails to properly drain out of the eye, causing a build-up of intraocular pressure. Read about the condition to understand everything from the signs and symptoms through to the treatment options available. 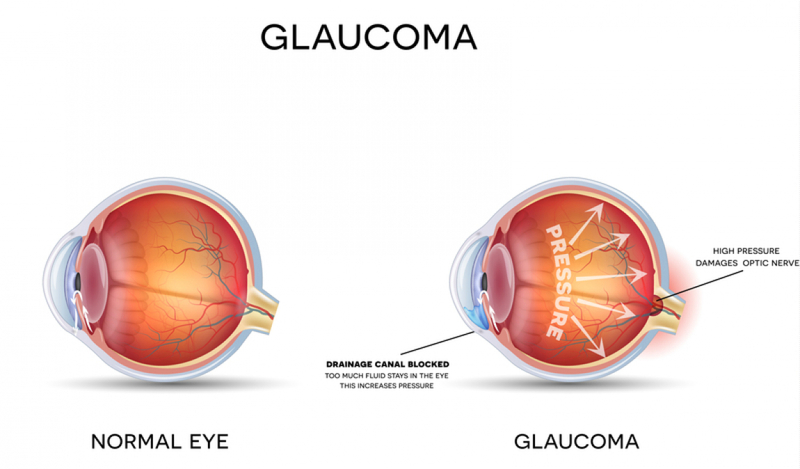 Glaucoma is a condition that involves an increase in pressure inside the eye. It occurs when the fluid in the eyeball, known as aqueous humour, fails to properly drain out of the eye, causing a build-up of intraocular pressure. This can lead to the optic nerve or the nerve fibres of the retina becoming damaged. Glaucoma can affect both eyes, but the condition may develop faster in one eye more than the other. Chronic open-angle Glaucoma – This form of Glaucoma is the most prevalent, and its progression can be very gradual. Primary angle-closure Glaucoma – This is a rare form of Glaucoma. Chronic primary angle-closure Glaucoma develops slowly, but acute primary angle-closure Glaucoma develops much faster with a rapid increase in intraocular pressure. Secondary Glaucoma – Secondary Glaucoma is normally a result of another eye injury or condition. Developmental Glaucoma (congenital Glaucoma) – This is a rare type but it can be serious. It is found in very young children and is often a result of an irregularity in the eye. Symptoms of Glaucoma can depend on the type you have. The symptoms of chronic open-angle Glaucoma are not normally noticeable as the condition is a slow developer. It affects the peripheral vision first before moving towards the centre as the condition develops, meaning you may not notice the damage straight away. You may also experience a feeling of nausea due to the above symptoms. They can appear and disappear for 1-2 hours at a time, but still cause your vision to deteriorate each time they happen. As secondary Glaucoma is normally caused by another condition, the symptoms can sometimes be mistaken. However, you may still experience hazy vision, or you may see halos when you look at lights. A squint, where one eye faces in a different direction to the other. Glaucoma happens as a result of a blockage in the eye stopping the drainage of fluid, causing the intra-ocular pressure to rise. Age – The older you are the more likely it is you will develop Glaucoma. Ethnicity – There is a higher risk of developing Glaucoma depending on your ethnicity. You are more likely to develop chronic open-angle Glaucoma if you are African or you are of Afro-Caribbean descent, while those of Asian descent are more likely to get acute angle-closure Glaucoma. Short-sightedness – Myopia can increase the risk of having chronic open-angle Glaucoma. Ocular Hypertension – Ocular hypertension is an increase in pressure in the eye, and it can increase the likelihood of developing chronic open-angle Glaucoma. Family – If other people in your family such as your parents or siblings have Glaucoma, you are more likely to develop it. Medical History – Medical conditions such as diabetes can also increase the risk of developing Glaucoma. Secondary Glaucoma can also be caused by another condition known as pseudoexfoliation Glaucoma. This is when the body produces irregular protein fibres that can prevent fluid from draining out, leading to increased intra-ocular pressure. While its treatment methods are the same as for primary Glaucoma, experts are unclear on what the causes of pseudoexfoliation Glaucoma are – most believe it may be genetic. The eyeball contains a fluid known as aqueous humour that is responsible for shaping the eye by creating intraocular pressure. The fluid is produced and drained into the bloodstream at the same rate, keeping the level of pressure constant. The draining tubes in the eye are known as the trabecular meshwork, and when they become obstructed the fluid cannot drain properly. The meshwork may also be blocked by an obstruction such as a blood vessel which can prevent the aqueous humour from draining out. This causes the condition known as Glaucoma, where the build-up of intraocular pressure can cause damage to the optic nerve and the retinal nerve fibres. However the reason for the initial blockage can often be uncertain. Glaucoma can take a while to notice as the condition normally affects the outer eye before moving inwards, meaning you may not realise your eyes have a problem until your vision is affected. You should generally go for an eye test at least every 2 years. If you are at a higher risk of developing Glaucoma, for example, if you have another eye condition; a condition that can affect the eyes such as diabetes or if someone else in your family has Glaucoma, then your optometrist may recommend more frequent testing. Eye Pressure Test – An eye pressure test, also known as tonometry, involves using something called a tonometer to measure your intraocular pressure. Anaesthetic is used before dye is applied to the cornea, then the tonometer shines a blue light on your eye to take a measurement. This can detect ocular hypertension, a risk factor of chronic open angle Glaucoma. Central Corneal Thickness – They may also measure your corneal thickness as this is thought to influence the meaning of the intra-ocular pressure measurement. Gonioscopy – A gonioscopy is when the outer edge of the front of your eye is inspected. The area between your iris and cornea is where the aqueous humour should drain out, and a gonioscopy can detect if the angle is open or blocked. 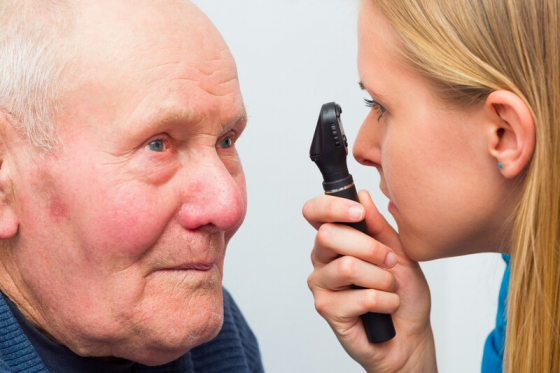 Visual Field Test – Visual field tests examine whether you have lost any of your vision. You are normally shown an arrangement of small lights and the eye care specialist will ask how many you can see. Some of the spots will be in your peripheral vision, and if you can’t see these it could be a sign that your eyesight has been affected. Optic Nerve Assessment – An optic nerve assessment is when the optometrist examines the nerve connecting your eyes and brain to see if it has been damaged. They usually use eye drops to widen your pupils before using a slit lamp to assess the nerve. The eye drops may temporarily affect your vision, therefore you should organise a way to get home as you might not be able to drive. If the optometrist believes you have Glaucoma they will refer you to an ophthalmologist – they can confirm the cause of the Glaucoma, how far it has developed, and the effect it has had on your eyes before suggesting treatment. Glaucoma can cause irreversible damage to your eyesight, making it important to diagnose and treat the condition early. The treatment normally aims to decrease intraocular pressure in the affected eye, but different types of Glaucoma can require different treatment methods. Any other medical conditions you have. Lightly pull down your bottom eyelid to create a pocket of space. Holding the dropper over your eye, let one drop fall into the pocket in your bottom eyelid. Shut your eyes for a few minutes to let the eye drop coat your eye. 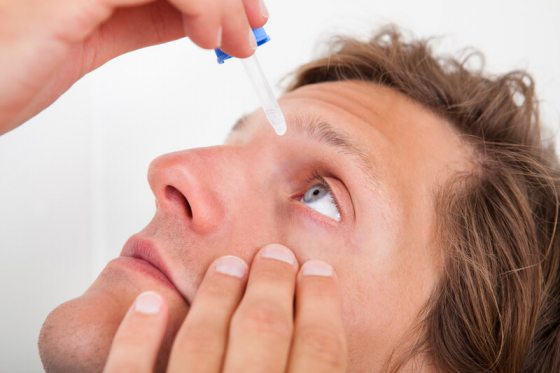 If you are using more than one type of eye drop, you should let 5-10 minutes pass before using a different type. Contact lens users may be required to use glasses as the eye drops can settle in the lens and damage your eyes. Beta Blockers – Beta blockers reduce the speed at which aqueous humour is produced in the eye, thereby reducing intra-ocular pressure. They are normally used once or twice a day, with possible side effects including stinging or burning, dryness, or itchiness in the eyes. However they can be dangerous if you have other medical conditions such as asthma or a heart condition. Sympathomimetics – It is thought that sympathomimetics slow down the production of aqueous humour while increasing the rate at which it drains out. The drops can be used twice a day, and they can result in soreness and redness in the eyes. They should also be used cautiously if you have a heart disease or high blood pressure. If the condition does not improved by using eye drops, you may be recommended laser treatment or surgery. Trabeculoplasty – Anaesthetic eye drops are used before a lens is placed in front of your eye. Small holes are made in the trabecular meshwork as the laser shines through the lens, resulting in decreased intraocular pressure as the fluid drains out. Cyclodiode Laser Treatment – Some of the cells that produce aqueous humour are destroyed, meaning less of the fluid is produced and the intraocular pressure is reduced. There are 4 types of surgery that can treat chronic open-angle Glaucoma. Trabeculectomy – This is the most common surgery for Glaucoma. A part of the trabecular meshwork is taken out so more fluid can drain away. Viscocanalostomy – Part of the outer layer of the eyeball known as the sclera is removed, allowing the aqueous humour to drain out of the eye and into the body. Deep Sclerectomy Operation – The trabecular meshwork is widened by an implanted device. An Aqueous Shunt Implant – A tube is implanted to help drain more fluid from the eye. Systemic Medicines – Systemic medicines quickly reduce intra-ocular pressure and are normally injected directly into the bloodstream. Laser Iridotomy – Lasers are used to make holes in the iris, widening the angle and allowing the aqueous humour to flow. As acute angle closure Glaucoma can develop rapidly in both eyes, both eyes should be treated even if only one eye exhibits symptoms. Cataract Surgery – Cataract surgery may be used as removing cataracts can widen the angle in your eye, therefore reducing intra-ocular pressure. Headaches that can be severe during initial treatment. Other forms of Glaucoma can also be treated by eye drops, surgery or laser treatment, depending on which Glaucoma it is and how developed it is.